The most difficult jump on the course is Taxis Ditch. Riders are not allowed to practice the jump and the only race in which it is featured is the Velká. While the Aintree Grand National is one of the best known steeplechase races in the world, the title of the toughest race now goes to the Velká Pardubická (the Grand Pardubice), a cross country steeplechase that has been run in Pardubice, Czech Republic since 1874. It takes place every year on the second Sunday in October. The length of the steeplechase is 4.25 miles (6.9 km), and horses must negotiate 31 jumps. Look at this course! It’s hard to imagine how long it would take to memorize the route. 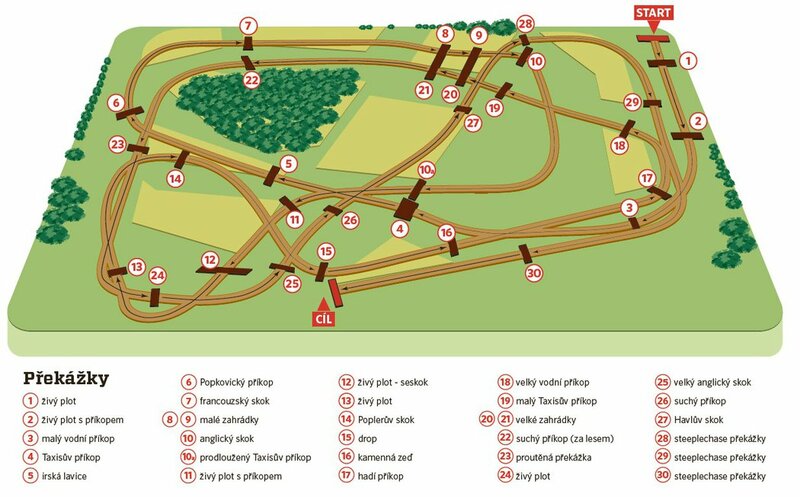 What makes the Velká Pardubická particularly difficult is that it is a combination between cross country and steeplechase. This is not a groomed track. It goes through all kinds of terrain. It is the only steeplechase in the world that is partially run over plowed fields (initially, half the race was over this kind of footing but that has been reduced as it’s so taxing), and when they are wet like they were today, that makes the footing deep and mucky. Adding to the difficulty is the course. It twists and turns in a way that makes the track not immediately obvious! This year’s winner was No Time To Lose, ridden by Jan Kratochvil. No Time to Lose was trained by Josef Vana, who won the race as a jockey eight times.